Jenny has been Chairman of Dawlish Art Group for the last six years. She was born in Cambridge and spent her teenage years in Hertfordshire before moving to Dawlish in 1964 where she raised her four children. Jenny loves Dawlish with it’s friendly people, beautiful beaches and proximity to Dartmoor as much now as she did when she arrived here 54 years ago. She has been trying to capture the beauty of this special part of Devon in oils, acrylics, watercolour and mixed media for many years. 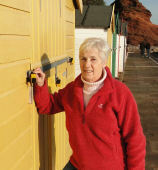 Her favourite place to paint is from her beach hut on Coryton Cove. To look at Jenny’s work click on a image below and a slideshow will open. The i button below each picture can be switched on/off.